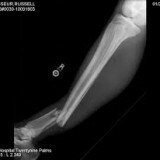 Home » Injury Awards » $140,000 for “very serious” femur fracture. $140,000 for “very serious” femur fracture. On August 29, 2013, the BC Supreme Court assessed damages for a serious femur injury and moderate wrist in jury.